"Bone for Tuna," the third episode of Boardwalk Empire's third season was another strong one. It begins with Nucky having a nightmare, where he shoots a young boy who's supposed to represent Jimmy Darmody. Nucky is haunted by his murder of Jimmy, who was essentially a son to Nucky, and in addition to nightmares and difficulty sleeping, Nucky also hallucinates while awake as the church ceremony near the end of the episode, and sees Jimmy as one of the kids in the church choir. The church ceremony itself was another homage to the baptism scene in The Godfather, and there's a meta reference to The Sopranos earlier, during Nucky's first conversation with Gyp Rosetti. Rosetti has taken over a gas station at Tabor Heights, preventing easy transport of liquor from Atlantic City to Arnold Rothstein in New York. 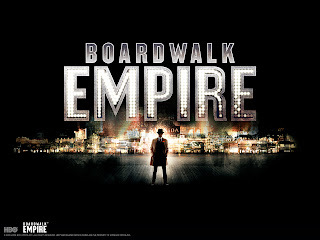 Nucky tells Gyp that if Gyp prevents Nucky from going through Tabor Heights, Nucky will use the pine barrens back roads, a reference to an episode of The Sopranos directed by Steve Buscemi, titled "Pine Barrens." I love the Gyp Rosetti character. He's a loose cannon, and literally anything can set him off. He and Nucky reach an agreement that Nucky will provide Rosetti with a month's worth of liquor, and Rosetti will be on his own from that point on. Rosetti claims to be satisfied with the deal, but his discussion with Gillian Darmody at her brothel indicates otherwise (with some foreshadowing that Rosetti will try to turn Eli against Nucky once again). After telling Rosetti he'd be there to see him off, Nucky snubs Rosetti by not appearing, and instead has Owen deliver Rosetti the message, "bone for tuna." It turns out that "bone for tuna" is a bastardization of the Italian phrase for good luck, bon fortuna. Owen, Irish and unfamiliar with Italian, wrote it down as he heard it, "bone for tuna." Rosetti freaks out later, wondering what Nucky meant by "bone for tuna." It's an interesting question, and not at all obvious: what did Nucky think he was doing by wishing Rosetti good luck in Italian? You can argue that there's nothing more to it than what it literally means, good luck to a business partner in his native tongue, but Nucky knows Rosetti can get bent out of shape over anything. And he also knows that Rosetti expected Nucky to see Rosetti off. Nucky had to also know that Rosetti would not be amused by Nucky's wishing him bon fortuna, whether in English or Italian. Rosetti simmers over the snub until a local police officer also wishes him good luck, this time in English. Rosetti douses him in gasoline and sets him on fire, in one of those shocking acts of violence that happen several times a season on Boardwalk Empire, but never gratuitously, always organically. The subplot I particularly enjoyed involved Margaret's Machiavellian power play, as she makes sure that both the bishop and Dr. Landau, who showed no interest in Margaret's idea for a women's clinic, appear at Nucky's church ceremony, and manipulates Landau into agreeing to the clinic with the bishop's blessing. This was a brilliant plan, perfectly executed, and it might very well be that Margaret Thompson is the most formidable character on the entire series. She gets what she wants and knows how to play human chess. Now for what I didn't really care for. First, the Lucky Luciano heroin trade storyline. It's just blah. I don't hate it, but I don't find it interesting. Second, everything involving Van Alden. This stuff I kind of hate. It's like the show comes to a halt when Van Alden appears. I was also hoping that Mickey Doyle might be written off the series by having Richard Harrow kill him, but they seemed to resolve that by the end of the episode, with Doyle still alive. Harrow also reached closure with Nucky, who no longer has to fear for his life, and made clear what attentive viewers already knew: he's seeking vengeance on behalf of Angela Darmody, not Jimmy. I'm really hoping there's more of Harrow as the season and series progresses. I found him to be one of the most intriguing characters during season two. As a side note, bacon appeared again, twice. And there were lots of phones ringing, and not always being answered. In fact, the episode began with audio of an old timey phone ringing, before there was even an image on the screen.